Robert Petersen is an American contemporary artist. He is quite versatile, working in painting, drawing, printmaking, sculpture and collages. The peak of his career was three decades ago, but the news is that he’s lately been returning to his famous journal drawing series and is active in preparing museum exhibitions. In 1973 he had his first solo exhibition and ever since, especially during the ’80s and early ’90s, he had a well-known career all around the world. Born in 1945 in the small town in Iowa, Robert Petersen moved with his family to California in the beginning of 50’s. Pursuing his love for printmaking, he graduated from California State University, Long Beach. During the beginning of 70’s he worked as a printer at Gemini G.E.L. There, Petersen participated in the print of editions for Roy Lichtenstein, Frank Stella and Robert Rauschenberg. Rauschenberg’s Stoned Moon series is his most notable print edition, during which he formed a close and long-lasting friendship with him. 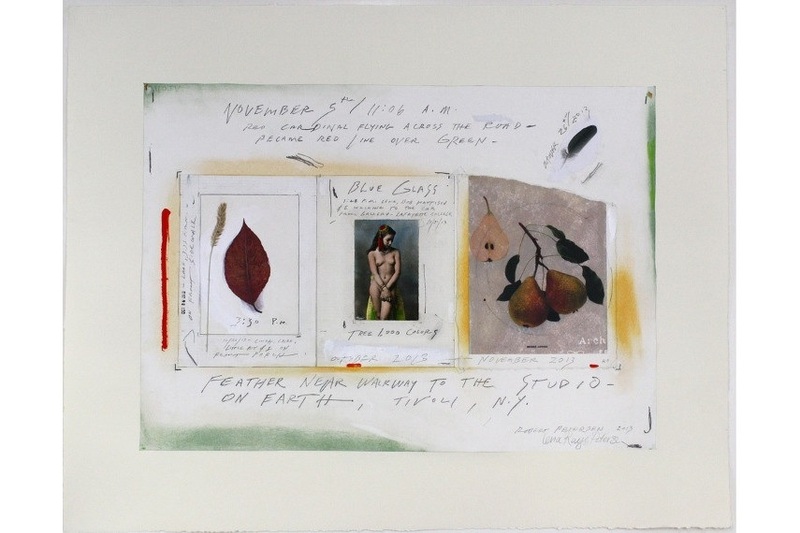 Those two lived and worked together until 1980 on Captiva Island, Florida, in Rauschenberg’s residence and studio. They even made their own experimental print shop called Untitled Press, Inc. which they used for printing their own art and art of many other American artists such as Brice Marden, Hisachika Takahashi, David Bradshaw, Robert Whitman, and Cy Twombly. In the early 1970’s Petersen created basic concepts of his monthly inspired journal drawings exploring the possibilities of his elaborate sketch pages. His main inspiration was his every day on the island where he lived with Rauschenberg. 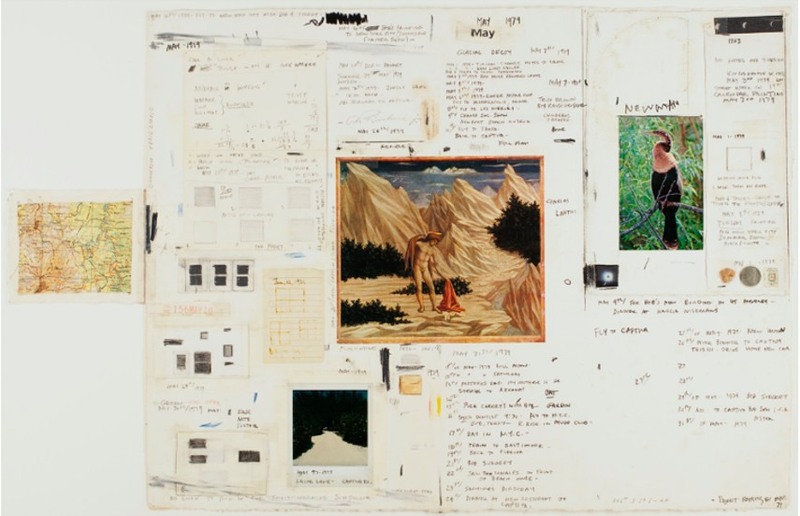 In his sketchbook he had a collection of daily reflections and observations of his surroundings, sketches, notes, photographs, illustrations and pictures from magazines or calendar, scribblings, postcard, but as well found objects, feathers, bits of glass – ephemeral meditative material that, each month, he combined on a single sheet of paper tacked on the wall. Later on, he would distill all the highlighted monthly moments into one single 20 x 30-inch drawing. What is described here is the principal technique of his works. 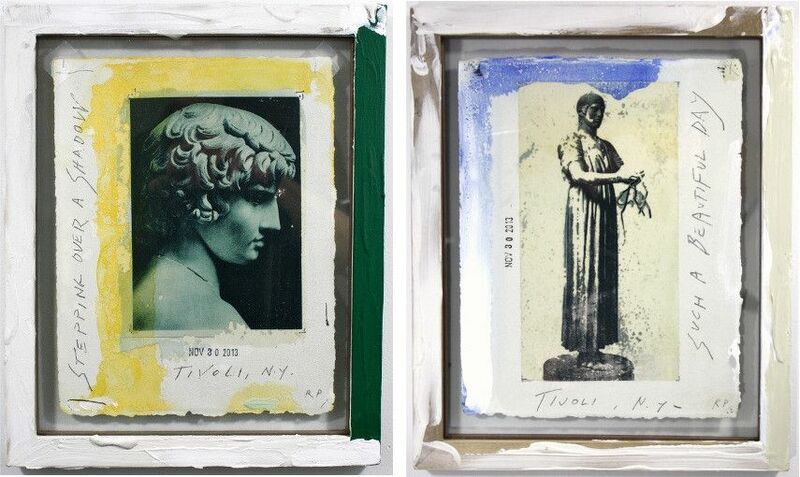 Robert Petersen has returned to creating journal drawings in his studio in Tivoli since 2012. Now, he transfers images using a water-based printmaking technique, hand coloring with vivid pigments, writing, blurring and marking spontaneously with pencils, paint, and pens. 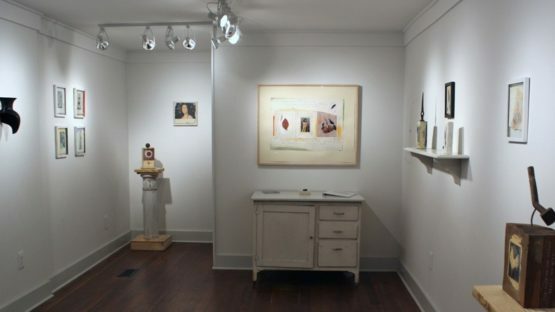 Besides, Petersen has made a collection of sculptures – found objects he has been gathering and annotating with descriptions of date, time and place they were found. They function as supplements and references for the drawings – they are artifacts that served as an inspiration for them, but as well they mark parts of the process of making art and changes in the aesthetic potentials by moving through time and space creating a museum like atmosphere. You can search to view his art at following museums: the Centre Georges Pompidou, Musee National d’Art Moderne, The Metropolitan Museum of Art, Robert Rauschenberg Foundation, James Rosenquist, etc. Robert Petersen lives and works in Tivoli, New York.